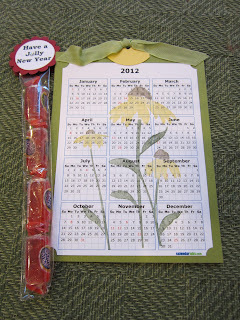 A 2012 Calendar and a candy tube of "Jolly New Year" Candy! What a clever combination gift - candy for the new year and a calendar of the new year! This calendar will go perfectly in my kitchen and will reside right next to my computer where I am always needing a calendar. Thanks Santa!!!! If you would like to make some of these, Santa found the calendar template at http://www.calendarlabs.com/. Price? Free!! !